I have to have THE most indulgent husband! The plans we had on Monday with my relatives fell through so he offered to take me to Len's Mills...woo hoo!!! The closest store is nearly two hours away so it's not a quick hop-in-the-car trip. Normally I am able to stop in when we are visiting our #1 son and his family and it's easy to justify going, but for him to suggest a trip JUST to go there was something I certainly wasn't about to say no to!!! I could easily have picked up twice as many possibilities but tried to limit myself to just these. Can't wait to play with them!! next day or so what it's destined to become. I also got some iron-on interfacing, a few balls of yarn and some invisible thread by Gutermann which I'm hoping will work better than what I have. We capped off the day by having a very late lunch/early supper in one of the restaurants we like. All in all a wonderful day!! - If I had the patience to knit a large project I would love THIS. - Remembrance Day is rapidly approaching so perhaps you'd like to make some of THESE or THESE. - If you have some felt scraps perhaps you'd like to have a go at making THESE. - If you like kaleidoscope patterns and would like to stitch your own, Mary Corbet has just released her pattern book and you can find more information HERE. 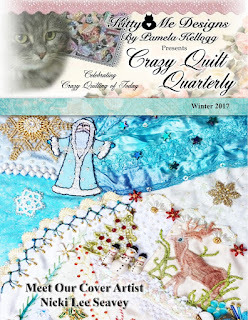 - Kathy Shaw has announced a fun stitch-a-long using her latest book 'Fancy Seam Designs'. Go and have a look HERE to find out more and join in the fun! - Make peace with your past so it doesn't spoil your present. - What others think of you is not worth listening to. - Time heals almost everything, give the time some time to work. - No one is the reason of your happiness except you and yourself. - Don't compare your life with others, you have no idea what their journey is all about. - Stop thinking too much, it's alright not to know. - Smile, you don't have to solve all the problems of the world. Terrific DH to take you barn shopping. I can imagine many more barns arriving on your home page. Lots of great choices there. Don't forget to trap your invisible thread in the base of the Gutermann spool between uses. A good tip from yourself. A two hour drive to a fabric store....man that guy LOVES you! I equate that to a trip from my house to Chicago. I can honestly say Terry would never suggest it, lol. But I am lucky to have great local shops and he will gladly drive to any of them. I don't even have to justify why I need more fabric as he looks at my stash, lol. You got some good barn creating cuts. Mary Anne that drive with your hubby was a nice day heh? lots of lovely fabric. thanks for the links. Yummy fabrics and there will be some smart barns in there I'm sure! Yay! What a nice hubby! And he got to spend 4 hours driving and chatting to you. Perfect. now there's a rare breed!! A man who encourages visits to fabric shops! !